All of the options listed below can be prepared ahead of time and in bulk. This is a great way to keep cost down even more. 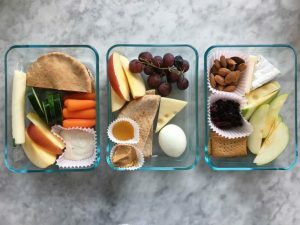 Prepare 5 servings of the below options for a weeks worth of healthy lunches and low cost. 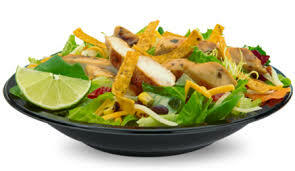 Directions: Toss all ingredients together to make a Southwest Salad. This salad is low in refined carbohydrates, high in healthy fats, and quality protein. The protein and the fats will keep you feeling full for longer and prevent a spike in insulin and poor energy in the afternoon. 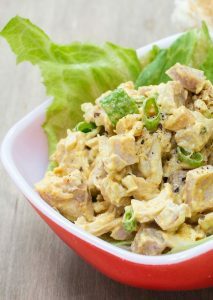 Mix all ingredients and spoon onto lettuce leaves. Eat immediately. These wraps are free of refined sugar, high in protein and low in starchy carbohydrates. The healthy fats and protein will also prevent a insulin spike and crash resulting in less afternoon cravings. Perfect option for someone who likes to eat a light lunch at his or her desk. These protein plates can be mixed up with whatever you have in your house. Place ingredients into a “Bento Box” or similar container and enjoy a cold and quick lunch. This lunch is rich in fiber from the fruits and vegetables, healthy fats and protein.